Inky Fairy Designs: FWF - It's been awhile! It's been awhile since I've used my Unity Stamps. I'm always amazed at how quickly a card comes together when I use them though! It's like the mojo just flows thru them magically! I love that and that's why I love my Unity stamps! I got these shoes in a random bag of Unity stamps and they are SO stinkin' cute! I just had to ink them up as soon as I could. 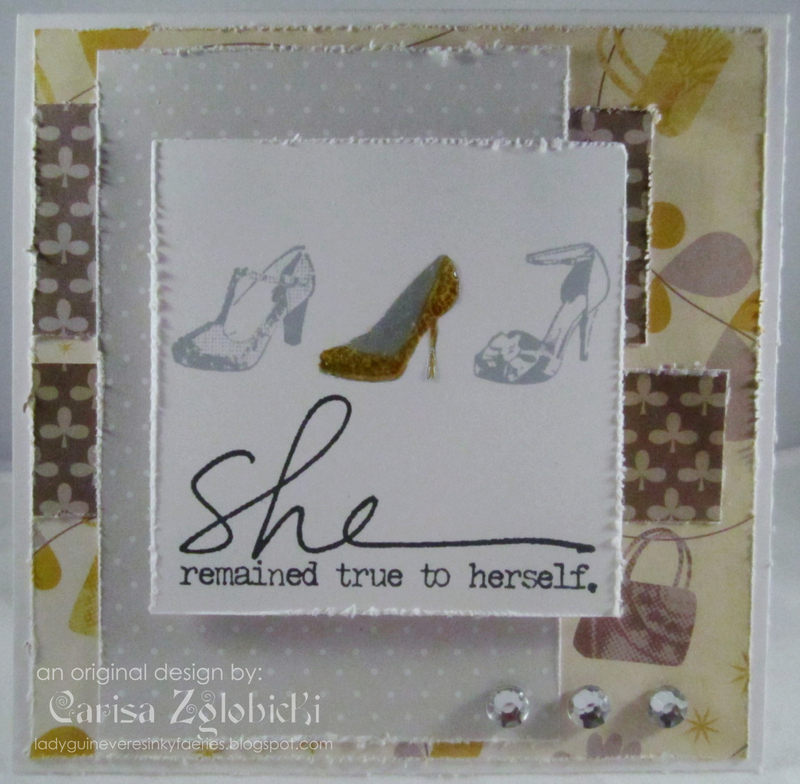 And then I love the sayings in my She stamp set and thought this was perfect for these fabulous shoes! I paired it all with some Cosmo Cricket Upcycle papers I recently picked up on a shopping spree thru Archiver's. Now I wish I had picked up more of this line as I love it! Stamps: Unity Stamp Company She & the shoes not sure came in a bag of random unity stamps! O-M-G... i adore this! So beautiful!! Fabulous card, I love the colours and papers, your layout is a perfect showcase for the fantastic image and such a great sentiment. Such a beautiful card!! Love it!! Thank you for joining Art Impressions Challenge#12!! Very pretty! Love the sparkly shoe! Love this!! Those shoes are fabulous!! A beautiful card! Thanks for playing with us at the Pixie Cottage! Gorgeous project! Love your work! HO! I love shoes and purse paper LOL I think this card is calling my name! Super cute, Carisa! Great take on the sketch! A special card indeed. Love the distressing. Thanks for playing with The Pixie Cottage. I love all your layers and the shoes rock!!! Awesome card! Love the stamps you used and the Upcycle patterns! Great job with the SFYTT, too! Fantastic card and I love that sentiment!! Thanks for Cooking it up with Katie this week! That's lovely!!! that's smart and very chic!! !